The river Pregel divides the town of Konigsberg into four separate land masses, A, B, C, and D. Seven bridges connect the various parts of town, and some of the town's curious citizens wondered if it were possible to take a journey across all seven bridges without having to cross any bridge more than once. All who tried ended up in failure, including the Swiss mathematician, Leonhard Euler (1707-1783)(pronounced "oiler"), a notable genius of the eighteenth-century. The lessons of those who are engaged in the mathematics of, must nurture the powers of intuition to advance the road of uncharted waters so as to be inspired to see nature and what underlies it as if guided by some unseen hand. How would one tell another of "such a feeling" as they progress on their own journey while having all the tools of their trade in mathematics with them? 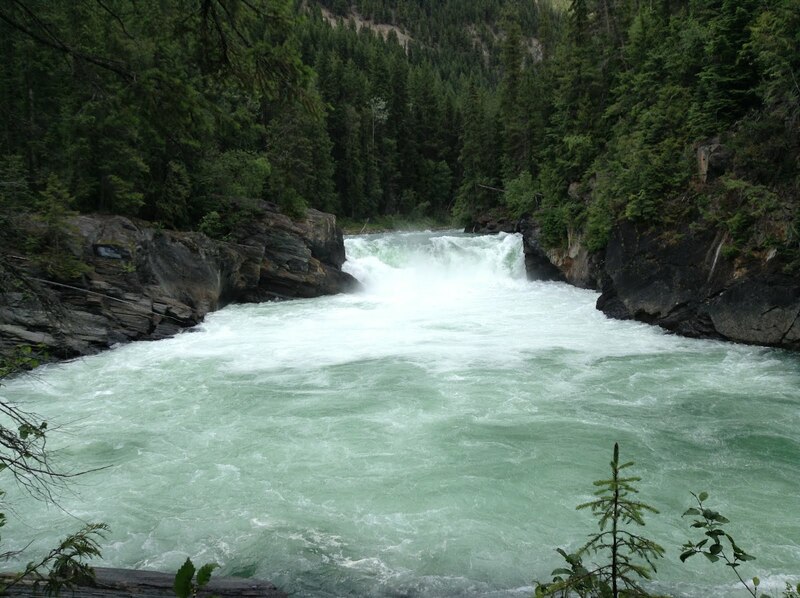 Outside of themself, one might look to find conducive places sounds, inspirations that would help them on their journey. That journey is usually alone, but if you meet another that has an equal understanding and can help progress you beyond the points on which you are stuck, why would you not collaborate to move forward? To help others move forward? Now you must know what sets my mind to think in such abstract spaces. "Probability of seeing a stage in a concert." Topological ideas are present in almost all areas of today's mathematics. The subject of topology itself consists of several different branches, such as point set topology, algebraic topology and differential topology, which have relatively little in common. We shall trace the rise of topological concepts in a number of different situations. The Living With a Star (LWS) program emphasizes the science necessary to understand those aspects of the Sun and the Earth's space environment that affect life and society. The ultimate goal is to provide a predictive understanding of the system, and specifically of the space weather conditions at Earth and in the interplanetary medium. Who would have ever thought to consider our own Sun as a member of the Cosmos, as a Star? As with anything if we want peer deeper in the construction of the world around us it is necessary sometimes to put on different glasses for different perspectives. So it is about how we can look at the universe around us. The Balloon Array for Radiation-belt Relativistic Electron Losses mission is a balloon-based Mission of Opportunity to augment the measurements of NASA's RBSP spacecraft. This mission is part of SMD's LWS program. Cluster is a European Space Agency program with major NASA involvement. The 4 Cluster spacecraft are providing a detailed three-dimensional map of the magnetosphere, with surprising results. This mission is part of SMD's Heliophysics Research program. IMAGE studied the global response of the magnetosphere to changes in the solar wind. Major changes occur to the configuration of the magnetosphere as a result of changes in and on the Sun, which in turn change the solar wind. IMP 8 has deepened understanding of the space environment near Earth in many ways. Observations from IMP 8 provided insight into plasma physics, the Earth's magnetic field, the structure of the solar wind and the nature of cosmic rays. The primary goal of the Interface Region Imaging Spectrograph (IRIS) explorer is to understand how the solar atmosphere is energized. The IRIS investigation combines advanced numerical modeling with a high resolution UV imaging spectrograph. The ISEE (International Sun-Earth Explorer) program was an international cooperative program between NASA and ESA to study the interaction of the solar wind with the Earth's magnetosphere. The RBSP mission will provide scientific understanding, ideally to the point of predictability, of how populations of relativistic electrons and ions in space form and change in response to variable inputs of energy from the Sun. The Solar Anomalous and Magnetospheric Particle Explorer is investigating the composition of local interstellar matter and solar material and the transport of magnetospheric charged particles into the Earth's atmosphere. SNOE ("snowy") was a small satellite investigating the effects of energy from the Sun and from the magnetosphere on the density of nitric oxide in the Earth's upper atmosphere. Solar and Heliospheric Observatory (SOHO) is a solar observatory studying the structure, chemical composition, and dynamics of the solar interior. SOHO a joint venture of the European Space Agency and NASA. This mission is part of SMD's Heliophysics Research program. Solar Probe Plus will be a historic mission, flying into one of the last unexplored regions of the solar system, the Sun’s atmosphere or corona, for the first time. This mission is part of SMD's LWS Program. The Space Environment Testbeds (SET) Project performs flight and ground investigations to understand how the Sun/Earth interactions affect humanity. Space Technology 5 (ST5) flight tested its miniaturized satellites and innovative technologies in the harsh environment of Earth's magnetosphere. Thermosphere, Ionosphere, Mesosphere Energetics and Dynamics (TIMED) explores the energy transfer into and out of the Mesosphere and Lower Thermosphere/Ionosphere (MLTI) region of the Earth's atmosphere. This mission is part of SMD's Solar Terrestrial Probes Program. The Ulysses Mission is the first spacecraft to explore interplanetary space at high solar latitudes, orbiting the Sun nearly perpendicular to the plane in which the planets orbit. This mission is part of SMD's Heliophysics Research program. Wind studies the solar wind and its impact on the near-Earth environment. This mission is part of SMD's Heliophysics Research program. Yohkoh, an observatory for studying X-rays and gamma-rays from the Sun, is a project of the Institute for Space and Astronautical Sciences, Japan. In astrology, a supermoon is a full or new moon that coincides with a close approach by the Moon to the Earth. The Moon's distance varies each month between approximately 354,000 km (220,000 mi) and 410,000 km (254,000 mi) due to its elliptical orbit around Earth. ...a new or full moon which occurs with the Moon at or near (within 90% of) its closest approach to Earth in a given orbit (perigee). In short, Earth, Moon and Sun are all in a line, with Moon in its nearest approach to Earth. The combined effect of the Sun and Moon on the Earth's oceans, the tide, is greatest when the Moon is new or full (see Tide#Range variation: springs and neaps). At lunar perigee the tidal force is even stronger, resulting in more extreme high and low tides, but even at its most powerful this force is still weak. Some studies have reported a weak correlation between lunar activity and shallow, very low intensity earthquakes. However, no evidence has been found of any correlation with major earthquakes. There are approximately four to six supermoons annually. The following is a list of past and predicted extreme supermoons. ^ a b c Plait, Phil. "No, the “supermoon” didn’t cause the Japanese earthquake". Discover Magazine. http://blogs.discovermagazine.com/badastronomy/2011/03/11/no-the-supermoon-didnt-cause-the-japanese-earthquake/. Retrieved 14 March 2011; published March 11, 2011. ^ Hawley, John. "Appearance of the Moon Size". Ask a Scientist. Newton. http://www.newton.dep.anl.gov/askasci/phy99/phy99371.htm. Retrieved 14 March 2011; no publication date. ^ a b c Nolle, Richard. "Supermoon". Astropro. http://www.astropro.com/features/articles/supermoon/. Retrieved 14 March 2011; no publication date; modified March 10, 2011. ^ Ledermann, Tug. "'Perigee-syzygy' caused full moon to look bigger, brighter in October". University Wire. http://www.highbeam.com/doc/1P1-146006378.html. Retrieved 14 March 2011; published November 13, 2007. ^ Plait, Phil. "Tides, the Earth, the Moon, and why our days are getting longer". Bad Astronomy. http://www.badastronomy.com/bad/misc/tides.html. Retrieved 14 March 2011; published 2008; modified March 5, 2011. ^ "Apogee and Perigee of the Moon". Moon Connection. http://www.moonconnection.com/apogee_perigee.phtml. Retrieved 14 March 2011; no publication date. ^ "Can the position of the moon affect seismicity?". The Berkeley Seismological Laboratory. http://seismo.berkeley.edu/faq/planets.html. 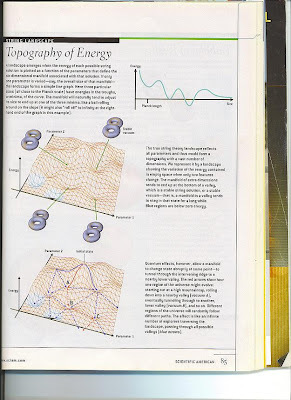 Retrieved 14 March 2011; published 1999. ^ Fuis, Gary. "Can the position of the moon or the planets affect seismicity?". U.S. Geological Survey: Earthquake Hazards Program. http://earthquake.usgs.gov/learn/faq/?faqID=109. Retrieved 14 March 2011; no publication date. ^ Wolchover, Natalie. "Will the March 19 'Supermoon' Trigger Natural Disasters?". Life's Little Mysteries. http://www.lifeslittlemysteries.com/will-supermoon-cause-earthquake-storm-natural-disasters-1442/. Retrieved 15 March 2011; published March 9, 2011. ^ Paquette, Mark. "Extreme Super (Full) Moon to Cause Chaos?". Astronomy Weather Blog. AccuWeather. http://www.accuweather.com/blogs/astronomy/story/46417/extreme-super-full-moon-to-cause-chaos.asp. Retrieved 14 March 2011; published March 1, 2011. ^ "Is the Japanese earthquake the latest natural disaster to have been caused by a 'supermoon'?". The Daily Mail. http://www.dailymail.co.uk/sciencetech/article-1365225/Japan-earthquake-tsunami-Did-supermoon-cause-todays-natural-disaster.html. Retrieved 14 March 2011; published March 11, 2011. ^ Byrd, Deborah. "Debunking the "Supermoon" Theory of Japan's Earthquake and Tsunami". Fast Company. http://www.fastcompany.com/1737710/the-supermoon-and-japans-89-magnitude-earthquake. Retrieved 14 March 2011; published March 11, 2011. ^ Nolle, Richard. "20th Century SuperMoon Alignments". Astropro. http://www.astropro.com/features/tables/cen20ce/suprmoon.html. Retrieved 14 March 2011; no publication date. ^ Nolle, Richard. "21st Century SuperMoon Alignments". Astropro. http://www.astropro.com/features/tables/cen21ce/suprmoon.html. Retrieved 14 March 2011; no publication date. ^ Fazekas, Andrew. ""Supermoon": Biggest Full Moon in 18 Years Saturday". National Geographic. http://news.nationalgeographic.com/news/2011/03/110318-supermoon-earth-japan-earthquake-tsunami-science-space-biggest-full-moon/. Retrieved 20 March 2011; published March 17, 2011. I was glad to see link by Bee of Backreaction that expanded on what I had learn previously from Wayne Hu. My comments in relation to Kip Thorne was in relation to the development of LIGO testing model . To combine all assets of our abilities experimentally in the pursuance of science is to see that the expression of the universe would include "all these things" as demonstrated in Kip Thorne's plate. So while we may look at the energy spectrum of Gamma, we are also looking at part of the expression of science from very minute and particulate understandings as if we would turn to the cosmos and say yes this is part of the view as well. Tokyo Electric Power Co./AP View of damaged No. 4 unit of the Fukushima nuclear plant in northeastern Japan. Sometimes the tools in which we use to measure events in space as satellites out, can be used to help detection flow patterns of radiation emissions from the Nuclear Reactors affected by Earthquakes in Japan? A massive 8.9/9.0 magnitude earthquake hit the Pacific Ocean nearby Northeastern Japan at around 2:46pm on March 11 (JST) causing damage with blackouts, fire and tsunami. On this page we are providing the information regarding the disaster and damage with realtime updates. The large earthquake triggered a tsunami warning for countries all around the Pacific ocean. A Microscope on a Macroscopic World? "Nothing to me would be more poetic; no outcome would be more graceful ... than for us to confirm our theories of the ultramicroscopic makeup of spacetime and matter by turning our giant telescopes skyward and gazing at the stars,"
Scientists using NASA's Fermi Gamma-ray Space Telescope have detected beams of antimatter produced above thunderstorms on Earth, a phenomenon never seen before. 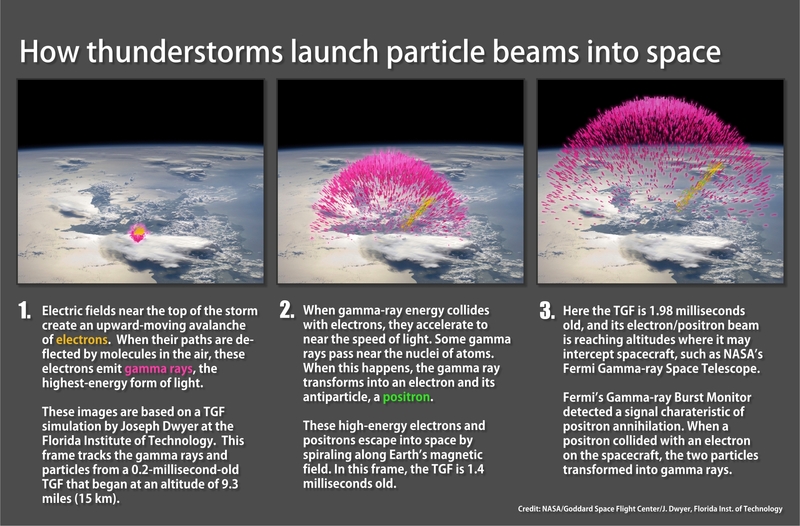 Scientists think the antimatter particles were formed in a terrestrial gamma-ray flash (TGF), a brief burst produced inside thunderstorms and shown to be associated with lightning. It is estimated that about 500 TGFs occur daily worldwide, but most go undetected. For me, the idea of a backdrop measure, as if Thomas Young experimentally fires his photon gun, the collision points at the LHC provide dimensional references(flight paths) to events that are measured by comparison of LHC too, muon detection facilitations as if, Cosmic Rays collisions in faster then light medium of ice, resulting in ICECUBE data. Cerenkov. Muon detection scenarios are useful tools to speeds through earth and matters for consideration anyway. Think of Volcano here or looking through pyramids. That's the plan anyway right? Are There Extra Dimensions of Space? A QGP is formed at the collision point of two relativistically accelerated gold ions in the center of the STAR detector at the relativistic heavy ion collider at the Brookhaven national laboratory. Some of these issues in relation to the LHC are what I tried to explain to Searosa. HOT A computer rendition of 4-trillion-degree Celsius quark-gluon plasma created in a demonstration of what scientists suspect shaped cosmic history. Here's what has to be considered. There is a calculated energy value to the collision process. You add that up as all the constituents of that process, and what's left is, so much energy left to be discerned as particulate expressions as beyond that collision point. This may not be truly an accurate portrayal yet it is one that allows perspective to consider the spaces at such microscopic levels for consideration. The perspective of valuations with regard to the LHC is whether or not there is sufficient energy within the confines of LHC experiments in which to satisfy the questions about extra those dimensions. It seems the parameters of those decisions seem to be sufficient? It is believed that in the first few microseconds after the Big Bang, our universe was dominated by a strongly interacting phase of nuclear matter at extreme temperatures. An impressive experimental program at the Brookhaven National Laboratory on Long Island has been studying the properties of this nuclear plasma with some rather surprising results. We outline how there may be a deep connection between extra-dimensional gravity of String Theory and the fundamental theories of subatomic particles can solve the mystery of the near-ideal fluid properties of the strongly coupled nuclear plasma. The QGP has directed attention to a method of expression with regard to that collision point. First direct observation of jet quenching. At the recent seminar, the LHC’s dedicated heavy-ion experiment, ALICE, confirmed that QGP behaves like an ideal liquid, a phenomenon earlier observed at the US Brookhaven Laboratory’s RHIC facility. This question was indeed one of the main points of this first phase of data analysis, which also included the analysis of secondary particles produced in the lead-lead collisions. ALICE's results already rule out many of the existing theoretical models describing the physics of heavy-ions. See: 2010 ion run: completed! The equations of string theory specify the arrangement of the manifold configuration, along with their associated branes (green) and lines of force known as flux lines (orange). The physics that is observed in the three large dimensions depends on the size and the structure of the manifold: how many doughnut-like "handles" it has, the length and circumference of each handle, the number and locations of its branes, and the number of flux lines wrapped around each doughnut. Early on looking at spaces, it was a struggle for me to understand how extra dimensions would be explained. It was easy using a coordinated frame of reference as x,y,z, yet, how much did you have to go toward seeing that rotation around each of those arrows of direction would add greater depth of perception about such spaces? It's easier if you just draw the picture. In superstring theory the extra dimensions of spacetime are sometimes conjectured to take the form of a 6-dimensional Calabi–Yau manifold, which led to the idea of mirror symmetry. The benefit of phenomenological approaches in experimental processes to attempt to answer these theoretical points of views. The first results on supersymmetry from the Large Hadron Collider (LHC) have been analysed by physicists and some are suggesting that the theory may be in trouble. 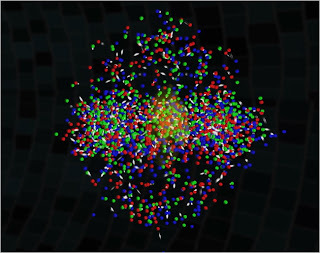 Data from proton collisions in both the Compact Muon Solenoid (CMS) and ATLAS experiments have shown no evidence for supersymmetric particles – or sparticles – that are predicted by this extension to the Standard Model of particle physics. Will the LHC find supersymmetry Kate McAlpine ? 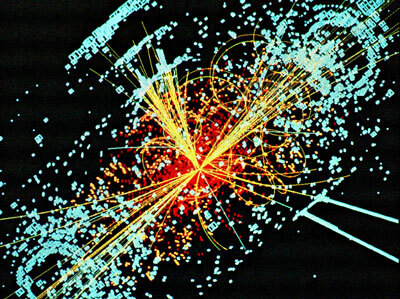 Beautiful theory collides with smashing particle data." Implications of Initial LHC Searches for Supersymmetry"
The Novum Organum is a philosophical work by Francis Bacon published in 1620. The title translates as "new instrument". This is a reference to Aristotle's work Organon, which was his treatise on logic and syllogism. In Novum Organum, Bacon details a new system of logic he believes to be superior to the old ways of syllogism. This is now known as the Baconian method. For Bacon, finding the essence of a thing was a simple process of reduction, and the use of inductive reasoning. In finding the cause of a phenomenal nature such as heat, one must list all of the situations where heat is found. Then another list should be drawn up, listing situations that are similar to those of the first list except for the lack of heat. A third table lists situations where heat can vary. The form nature, or cause, of heat must be that which is common to all instances in the first table, is lacking from all instances of the second table and varies by degree in instances of the third table. The title page of Novum Organum depicts a galleon passing between the mythical Pillars of Hercules that stand either side of the Strait of Gibraltar, marking the exit from the well-charted waters of the Mediterranean into the Atlantic Ocean. The Pillars, as the boundary of the Mediterranean, have been smashed through opening a new world to exploration. Bacon hopes that empirical investigation will, similarly, smash the old scientific ideas and lead to greater understanding of the world and heavens. The Latin tag across the bottom is taken from the Book of Daniel 12:4. It means: "Many will travel and knowledge will be increased". "Now my plan is as easy to describe as it is difficult to effect. For it is to establish degrees of certainty, take care of the sense by a kind of reduction, but to reject for the most part the work of the mind that follows upon sense; in fact I mean to open up and lay down a new and certain pathway from the perceptions of the senses themselves to the mind." The emphasis on beginning with observation pervades the entire work. In fact, it is in the concept that the natural philosophy must begin from the senses that we find a revolutionary quality of Bacon’s philosophy, and its consequent philosophical method, eliminative induction, is one of Bacon's most lasting contributions to science and philosophy. Novum organum was actually published as part of a much larger work, Instauratio magna. Originally intending Instauratio magna to contain six parts (of which Novum organum constituted the second), Bacon did not come close to completing his metawork, as parts V and VI were never written at all. Novum organum, written in Latin and consisting of two books of aphorisms, was included in the volume that Bacon published in 1620; however, it was also unfinished, as Bacon promised several additions to its content which ultimately remained unprinted. After many similar aphoristic reiterations of these important concepts, Bacon presents his famous Idols. Bacon includes in this the idol the predilection of the human imagination to presuppose otherwise unsubstantiated regularities in nature. An example might be the common historical astronomical assumption that planets move in perfect circles. Bacon considered these “the greatest nuisances of the lot” (aph. 59). Because humans reason through the use of words, they are particularly dangerous because the received definitions of words, which are often falsely derived, can cause confusion. He outlines two subsets of this kind of idol and provides examples (aph 60). First, there are those words which spring from fallacious theories, such as the element of fire or the concept of a first mover. These are easy to dismantle because their inadequacy can be traced back to the fault of their derivation in a faulty theory. Second, there are those words that are the result of imprecise abstraction. Earth, for example, is a vague term that may include many different substances the commonality of which is questionable. These are terms are often used elliptically, or from a lack of information or definition of the term. These idols manifest in the unwise acceptance of certain philosophical dogmas, namely Aristotle's sophistical natural philosophy (aph. 63) which was corrupt by his passion for logic, and Plato's superstitious philosophy, which relied too heavily on theological principles. “But he who knows forms grasps the unity of nature beneath the surface of materials which are very unlike. Thus is he able to identify and bring about things that have never been done before, things of the kind which neither the vicissitudes of nature, nor hard experimenting, nor pure accident could ever have actualised, or human thought dreamed of. And thus from the discovery of the forms flows true speculation and unrestricted operation” (aph. 3). In this second book, Bacon offers an example of the process that of what he calls true induction. In this example, Bacon attempts to grasp the form of heat. The first step he takes is the surveying of all known instances where the nature of heat appears to exist. To this compilation of observational data Bacon gives the name Table of Essence and Presence. The next table, the Table of Absence in Proximity, is essentially the opposite—a compilation of all the instances in which the nature of heat is not present. Because these are so numerous, Bacon enumerates only the most relevant cases. Lastly, Bacon attempts to categorize the instances of the nature of heat into various degrees of intensity in his Table of Degrees. The aim of this final table is to eliminate certain instances of heat which might be said to be the form of heat, and thus get closer to an approximation of the true form of heat. Such elimination occurs through comparison. For example, the observation that both a fire and boiling water are instances of heat allows us to exclude light as the true form of heat, because light is present in the case of the fire but not in the case of the boiling water. Through this comparative analysis, Bacon intends to eventually extrapolate the true from of heat, although it is clear that such a goal is only gradually approachable by degrees. Indeed, the hypothesis that is derived from this eliminative induction, which Bacon names The First Vintage, is only the starting point from which additional empirical evidence and experimental analysis can refine our conception of a formal cause. Aside from the First Vintage and the Instances with Special Powers, Bacon enumerates additional "aids to the intellect" which presumably are the next steps in his "method." In Aphorism 21 of Book II, Bacon lays out the subsequent series of steps in proper induction: including Supports to Induction, Rectification of Induction, Varying the Inquiry according to the Nature of the Subject, Natures with Special Powers, Ends of Inquiry, Bringing Things down to Practice, Preparatives to Inquiry, and Ascending and Descending Scale of Axioms. These additional aids, however, were never explained beyond their initial limited appearance in Novum Organum. It is likely that Bacon intended them to be included in later parts of Instauratio magna and simply never got to writing about them. As mentioned above, this second book of Novum organum was far from complete and indeed was only a small part of a massive, also unfinished work, the Instauratio magna. Bacon is often studied through a comparison to his contemporary René Descartes. Both thinkers were, in a sense, some of the first to question the philosophical authority of the ancient Greeks. Bacon and Descartes both believed that a critique of preexisting natural philosophy was necessary, but their respective critiques proposed radically different approaches to natural philosophy. While “one was rational and theoretical in approach and was headed by Rene Descartes; the other was practical and empirical and was led by Francis Bacon.”  They were both profoundly concerned with the extent to which human’s can come to knowledge, and yet their methods of doing so projected diverging paths. On the one hand, Descartes’ begins with a doubt of anything which cannot be known with absolute certainty and includes in this realm of doubt the impressions of sense perception, and thus, “all sciences of corporal things, such as physics and astronomy." He thus attempts to provide a metaphysical principle (this becomes the Cogito) which cannot be doubted, on which further truths must be deduced. In this method of deduction, the philosopher begins by examining the most general axioms (such as the Cogito), and then proceeds to determine the truth about particulars from an understanding of those general axioms. So, in a basic sense the central difference between the philosophical methods of Descartes and those of Bacon can be reduced to an argument between deductive and inductive reasoning and whether to trust or doubt the senses. However, there is another profound difference between the two thinkers' positions on the accessibility of Truth. Descartes was obsessed with absolute Truth—indeed it seems to be the object of his aims. It is slightly ambiguous whether Bacon believed such a Truth can be achieved. In his opening remarks, he proposes “to establish progressive stages of certainty.” For Bacon, a measure of truth was its power to allow predictions of natural phenomena (although Bacon's forms come close to what we might call "Truth," because they are universal, immutable laws of nature). An interesting characteristic of Bacon's apparently scientific tract was that, although he amassed an overwhelming body of empirical data, he did not make any original discoveries. Indeed, that was never his intention, and such an evaluation of Bacon's legacy may wrongfully lead to an unjust comparison with Newton. Bacon never claimed to have brilliantly revealed new unshakable truths about nature—in fact, he believed that such an endeavor is not the work of single minds but that of whole generations by gradual degrees toward reliable knowledge. In center, while Plato - with the philosophy of the ideas and theoretical models, he indicates the sky, Aristotle - considered the father of Science, with the philosophy of the forms and the observation of the nature indicates the Earth. Many historians of the Art in the face correspondence of Plato with Leonardo, Heraclitus with Miguel Angel, and Euclides with Twine agree.